This week is International Babywearing Week. For me, babywearing is another way of helping James, helping us bond, letting him explore the word… and keeping my sanity. The theme this year is “best seat in the house” and it makes me tear up just thinking about it because it is a seat. It’s a place for James to sit that is not an activity seat, or in my lap, or in his wheelchair. It’s another tool for me to get James positioned properly and help him feel secure. I started babywearing with Connor when he was around two and a half and we lived in Hawaii. Connor could walk but got tired easily and the island is not exactly wheelchair friendly. We had some friends who owned baby carriers so I figured I’d give it a shot. I found a little shop on the island who carried ERGO carriers and tried one on. INSTANT LOVE. Even Kevin thought it was very comfortable. We put Connor on our backs in the carrier at the store and it felt like he was weightless. We talked with the sales lady and felt very happy with our purchase. We wore pretty regularly until Connor was 4. We didn’t stop because he got too heavy but because I kept pushing him to walk more and more independently and eventually he got to where he didn’t want to be carried. It made me sad to realize he was growing up, but that is a story for another day, and another post. 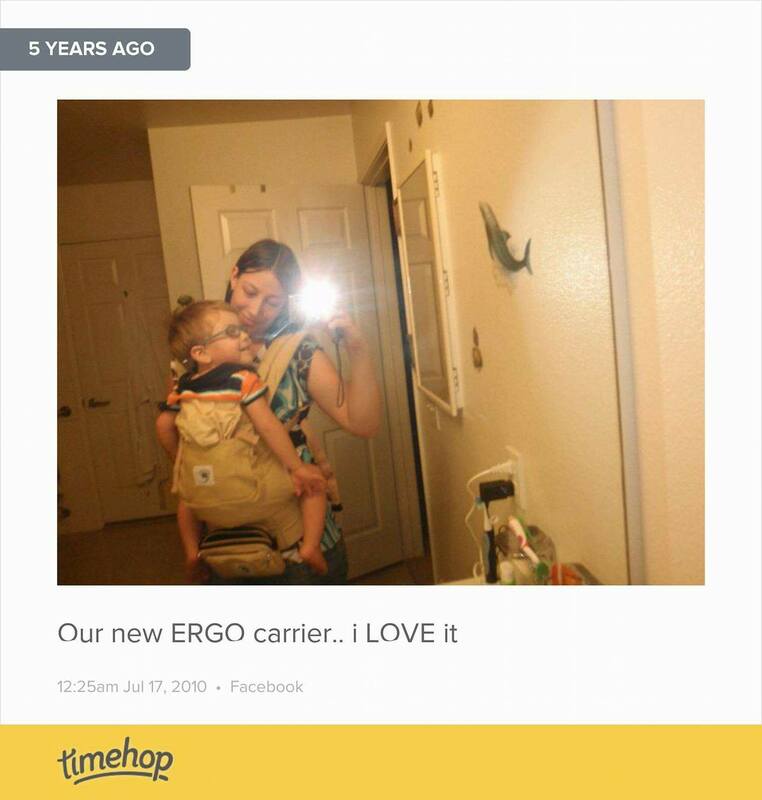 When I got pregnant with James I knew I wanted to have a baby carrier. I bought a Moby Wrap because all of my friends said these were best with newborns. Note to self: do research before buying. 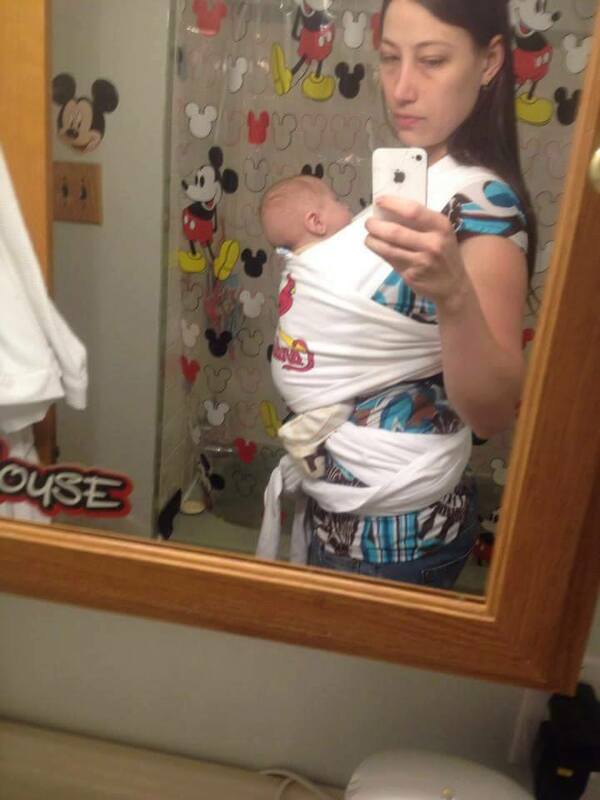 Even though I eventually loved the Moby Wrap, when I first bought it this thing terrified me! I had seen all my friends just naturally wrap their babies and now that I had my hands on one it felt like an octopus!! After many YouTube videos and Kevin helping me I figured it out. I eventually found the group on Facebook and joined. This group was amazing and filled with amazing women. I also found they were a bit too far for me to go to a meeting and found another group closer to me. I still talked to the ladies from the original group and made an amazing friend named Kit. Kit is the Co-founder of an organization called The Carrying On Project. It is a non-profit that gets baby carriers to low income military families to help with bonding while parents are deployed. Kit was selling a navy themed carrier and I was very interested! I was a little nervous since I had never used one so she offered to come to my house and help me… again… instant love. Not only with Kit, who is one of the most amazing people I know and is definitely part of my village, but also for the carrier which fit me so much better than the Moby. I talked to her about wearing James on my back since he was getting older and she said she didn’t see why not since I was comfortable wearing. I went to a local baby wearing meeting shortly and met Rhyannon ( Rhy for short) who helped me put James on my back for the first time.. and even though I was scared at first, I felt comfortable. This group of women I was meeting with and getting to know was amazing. 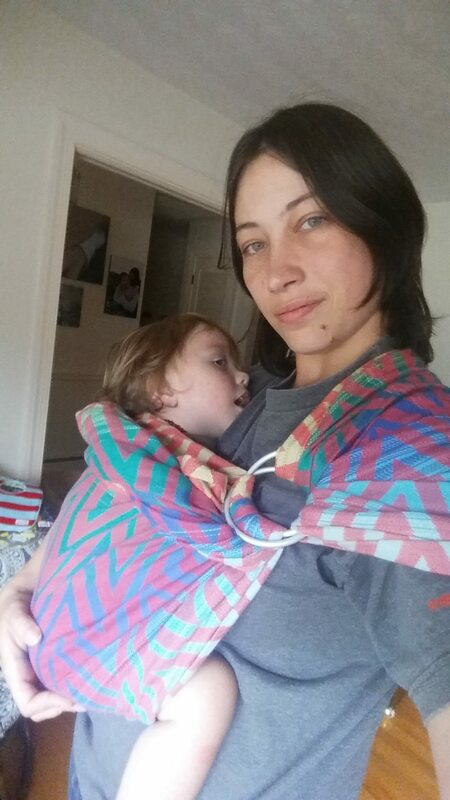 At another meeting, Rachel helped me with ring slings, she helped take some of the fear away and made me feel confident in using them to carry James. Another organization close to my heart is called Lift Me Up. They help give carriers, support and education to families of children with special needs. I could talk about them for hours but this story is about how baby wearing helps me. When James was 4 months old he started getting incredibly upset all the time. The only thing that calmed him down was nursing him and holding him. 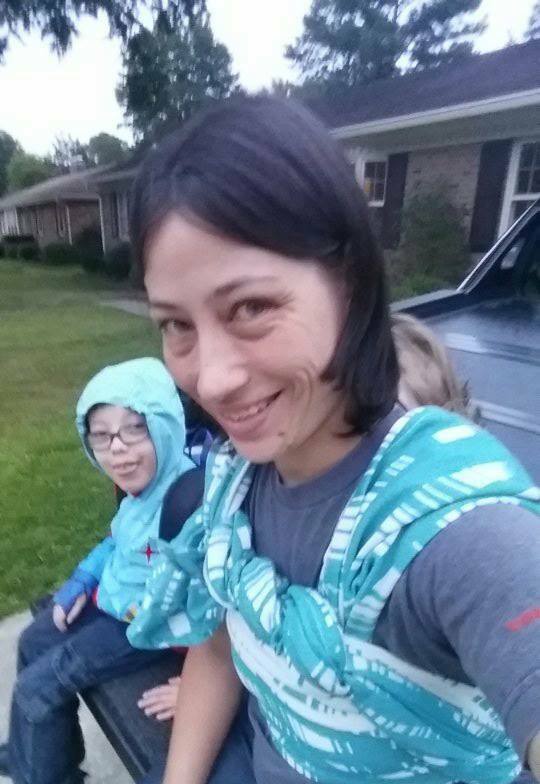 At the same time, I needed to be able to help Conner do a lot of things… enter babywearing. It helped me be able to cook dinner, get Connor dressed, get him on the bus, clean the house… it was amazing. It helps me calm him after he gets blood drawn or have an NG tube shoved down his throat. It makes it possible for me to keep him happy when daddy is gone out to sea and I have to cook dinner and help Connor with homework or when James is scared and needs mommy. It helps me when Connor is overwhelmed and needs positive pressure to help him calm down. It makes it easier when we are admitted to the hospital and we want to walk the halls so I don’t have to bring his wheelchair AND the IV pole. It makes it possible to take both kids on a walk by myself to the neighbor’s and not have to push two wheelchairs. It also helps him physically. I’ve asked his doctors numerous times if babywearing is good for him and I’ve gotten positive feedback. It helps keep him in a good seated posture by aligning his hips and spine. It helps him keep his head up, it promotes body awareness and meets his need for touch. It lets him explore the outside world around him while feeling safe right next to me. And when he is cutting teeth and nothing is calming him down and Connor is having a fit because his routine changed last minute… I can put James on my back and talk face to face with Connor. 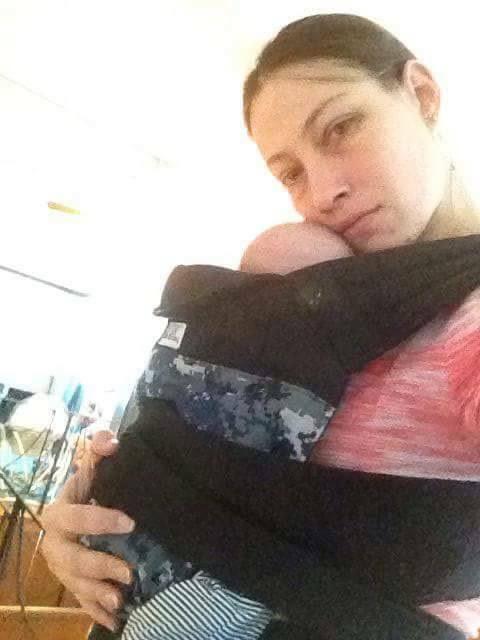 To me, babywearing is another tool in my arsenal to take care of and love my children. I never in a million years would of realized how big of an impact it would have on my life but it is by far one of my favorite things.